As Jane Austen said….it is a truth universally acknowledged… that the mirror lies, but the camera tells the truth. Okay…that’s not exactly what she said…the second part is all me. How many times have I checked myself in the mirror and thought…hmmm…not bad for 50 or 55 or (now) 58. And then, when Hubby and I are at a party, or an occasion, someone, sometime, snaps my picture and I eventually get a look at the result and gasp: “Who is that old fart?” Inevitably, I have my mouth open, talking, looking like I have five chins or no chin at all, waving my hands around and standing or sitting in a most unattractive position. A position that makes me look fat and scrawny all at the same time…with no waist and chicken legs. You laugh?! That is exactly what goes through my head every time I see a picture of myself. Every time. I have never been very photogenic… not in surprise snap shots nor in posed pictures. Yep, that’s me in grade 1. Rolling my eyes and grimacing. Other girls smiled sweetly with dimples. Not me. I’m giving the photographer a look that says “Hurry up and get on with it, cause I have more important things to do… like skipping or doing my spelling homework.” The camera always made me feel (and look) uncomfortable… or impatient. 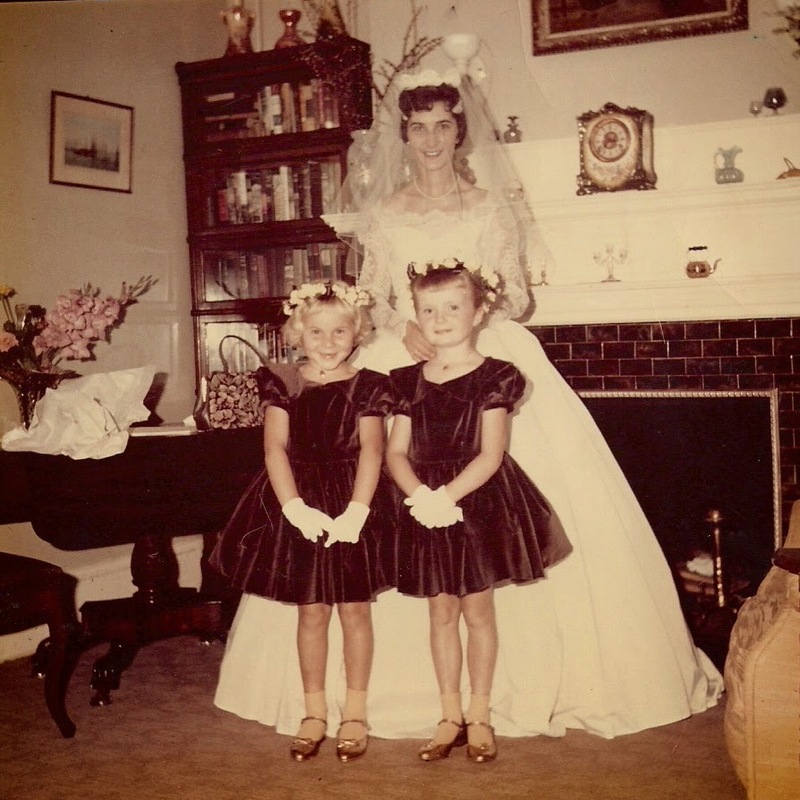 This is me and my cousin Edie when we were both six and flower girls at my cousin Eleanor’s wedding. Edie had the cutest dimples. 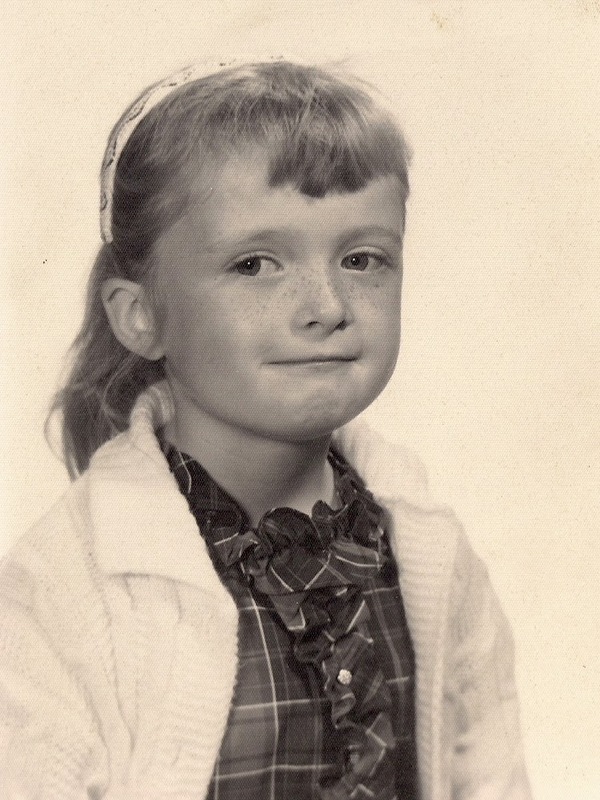 Me…I looked six going on forty…with my toes pointed out and my hands folded exactly like my grandmother. And I mean exactly. No cute girly posing for me. Maybe it was because I was always taller, skinnier, and more awkward than other kids my age. I just felt silly in front of the camera. Ah well. I don’t look uncomfortable or impatient in all the pictures taken of me. I’ve become pretty good at taking selfies since I started this blog. Some are even pretty good; some of them I even like. But seriously, you’d think that by fifty eight I’d get used to what I actually look like, as opposed to what I think I look like. So where am I going with this? Well, this September I will be attending my 40th high school reunion. Gawd… forty years. How is that possible? And of course I am already trying to decide what to wear. I mean I only have two months… I have to get moving on this! I will need a couple of chic and casual, ‘not trying too hard’ outfits, one dressy casual outfit and one dressy-dress. And I’m not sure I trust my mirror to tell me the truth about how I look. It seems that dresses have been on my mind lately. Mostly because I am on a two week “layover” between camping trips. 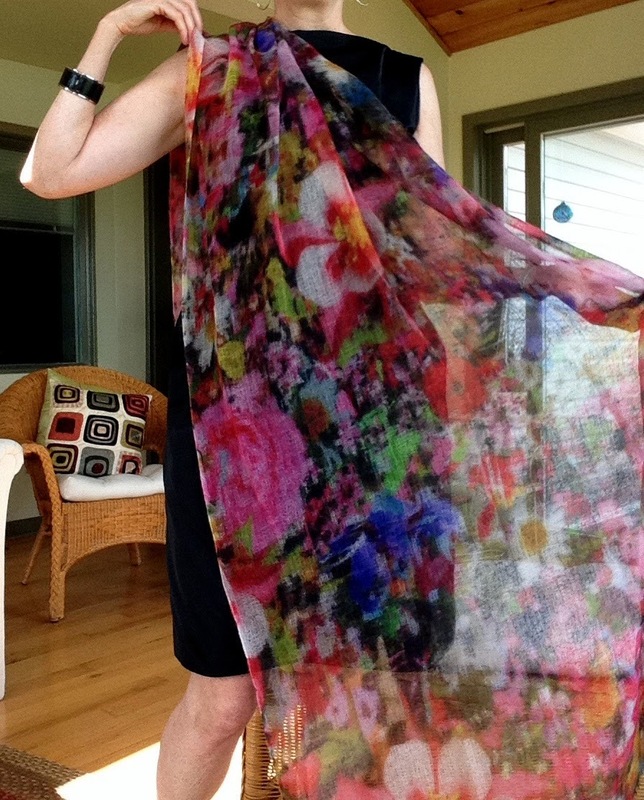 And when we get back from the bush… I always go a little wild with the girly thing. You know, getting facials, or pedicures, and wearing strappy sandals and skirts or dresses every chance I get. So I’ve been trying on my dresses and then taking pictures with my i-pad to see if I like the look. Inevitably, I look in the mirror… hmmm… okay. Then I take the picture… and it’s a whole other story. Like this seven year old Diane von Furstenberg dress. I love this dress and haven’t worn it for a couple of years. So I thought I would wear it out for lunch with a friend the other day. Looks okay, I thought. Good, in fact. Then I took the picture and thought…. Akkkk! My knees are so nobby. And I have no sign of a waist. And the dress looks too short to me. Now I know that some of this is true. I really do not have a waist, and I’ve always had knobby knees. But some of it was just me… overreacting to what I actually look like…. as opposed to what I think I look like… in my head. Anyway, it was too late to change by then. I readjusted the wrap so the dress hung a bit longer and grabbed my BIG Michael Kors bag. That looked a bit better. And so off I went in my DVF dress. 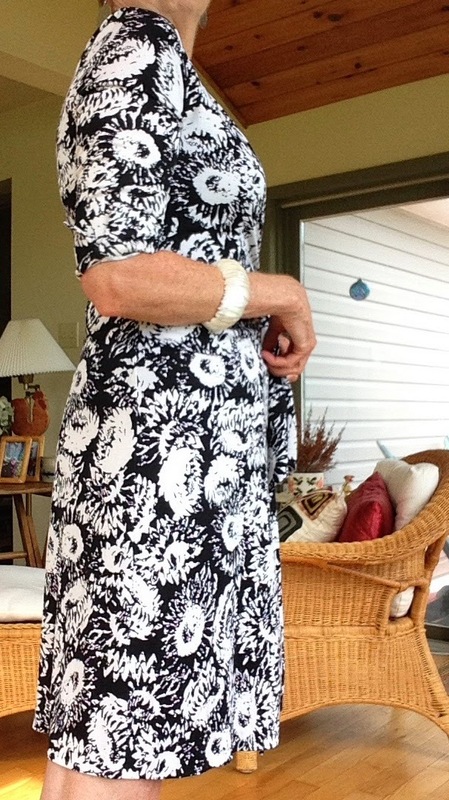 Which brings me to today…when I moved on to looking at the party dress I thought I might wear for the “dressy” event at my reunion. It’s a Lida Baday dress that I bought two (or maybe three) years ago for a friend’s wedding. I love the dress. I love the shape, the way that it drapes and is kind of rumply and not fussy, and the huge pockets that make it more casual. I put it on and felt great. Then I took my picture. Really? Really? I look that wide? Okay… maybe the angle of the shot makes me look wider? You think? And the bare legs with the pumps are not good..and if I were wearing pumps I would wear pantyhose. And not those shoes anyway. I’d need a higher heel. Then I put on the little jacket that goes with the dress. Oh jeeze… I was not liking this at all. Okay…so maybe it is a bit more rumpled than it should be…and those pearl earrings are too boring. I need jewelry that is a bit more edgy or bold. Like these earrings. And a black cuff. Or something. And I’ll lose the jacket and the pumps. And wear my flat sandals. And a pashmina. Nope. Except for the scarf which I adore… I was not feeling the love for this outfit. I still think that the Lida Baday dress is lovely. It’s just me, really. I don’t feel lovely in it. Anymore. I guess I’ll have to start shopping for something new. Or maybe with a new pair of “statement shoes” my Lida Baday dress would be… okay. Maybe? But it’s just so hard to tell if it’s the mirror or the camera which is telling me the truth. Still there’s lots of time yet. Like I said before, I don’t look uncomfortable or awkward in every picture. I love the one of me below. It was taken in 1985 by my hubby. 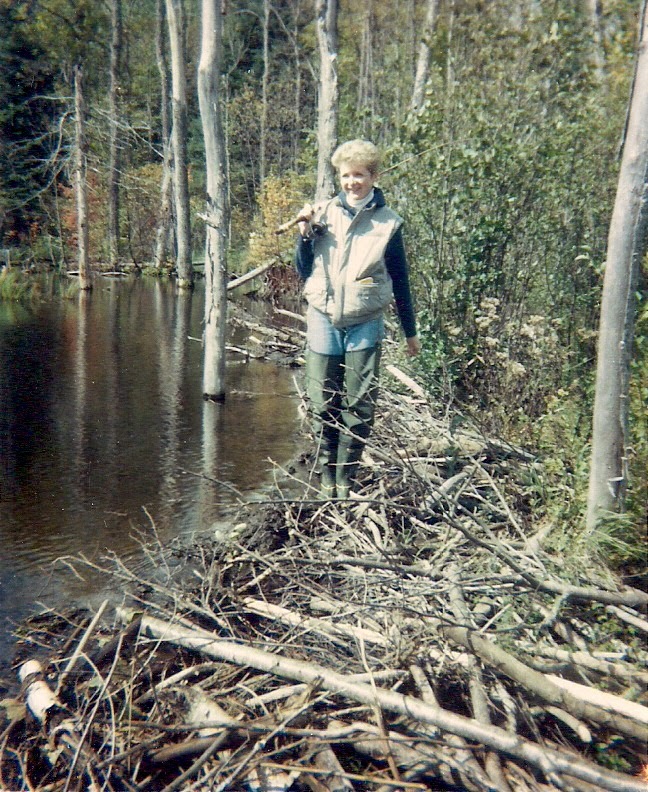 I’m standing with my fishing rod over my shoulder in baggy jeans on a beaver dam… and I’m wearing hip waders. And I look pretty good. You think maybe there’s a lesson here for me? Skip the makeup and expensive colour job? Stop worrying so much about what I’m wearing…. just hang out in … like, what… hip waders? Are you kidding me? I was 29 years old, people! We all look good at that age. So… I guess… that once we get back from our canoe trip next week… I’ll probably start looking for a new dress that I can wear to the reunion. Or a pair of shoes that changes the look of my old dress. And I am sure that I’ll find something I like and which looks fine. But undoubtedly during the shopping and trying on process… I will see one thing in the mirror and something quite different in pictures. So then, tell me… which reflection of me… is the real me? The one in the mirror or the one through the camera lens? Think you're being WAY too hard on yourself. 🙂 Your knees are just fine. I wonder if you're comparing your own picture to a mental image right out of a magazine…photoshopped, profesionally lit, garment pinned to within an inch of its life. I only say that because I still find I have to fight that urge/habit constantly. You look fine in both dresses. I think the second dress is just very "demanding." It's a very sculptural piece and really commands attention. You're right about the urge to compare oneself to an unrealistic image. Guilty of that, for sure. And I never thought that the dresses would be pinned on the models. Well, d'uh! Of course they are. Thanks for that. I thought you looked very nice at lunch, although I did not scrutinize the knees and I doubt anyone else will either! Thanks Susan. Let's do lunch again soon. Or tea? I am so much like you, and although I cannot follow my own advice, I have to say that you are too hard on yourself. But I get it, as I am too. I often have the experience where something looks good to me in the mirror and the horrid in a photo. I don't know why that is but I tend to trust the photo so if it looks bad in the photo I abandon that outfit. Having said that, certain angles don't make for flattering or realistic photos as all. We all look wider if the camera is shooting us from an upward angle. I hate most photos of myself and like you am usually caught gesturing and making faces or at a terrible angle, and then in posed photos I look self conscious. I am not sure there are very many actually attractive knees in this world. I am a bit knee obsessed and have studied the knees of many people including celebs and models. Knees are in fact a bit odd. I suggest you either embrace yours or wear your skirts a little longer, but the latter is easier said than done. All the photos of dresses you like are above the knee dresses. Find a new dress that you love to wear to the reunion. Find the best shoes to go with it. This is an event where you want to go with confidence. Definitely go big and dramatic with the earrings. Don't stress over black shoes with bare legs. I often have that same reaction to myself in bare legs and black shoes, but then I looked at you and thought, this looks just fine so maybe it looks just fine on me too. A waist is not everything. Some gorgeous celebrities have very little waist. Do a google search for images of Nicole Kidman, Cameron Diaz and Kim Cattral. They all have more straight up and down figures but always look great. I think the wrap dress looks lovely and you are being much too hard on yourself. The Lida Biday outfit is a bit dramatic and seems to wear you instead. I suspect it might do that on most people. It is definitely better without the jacket but I still prefer the DvF dress. You're right…about the dresses I like. I have always gravitated to that length. When I was younger, of course, I did like a mini. Now I like my skirts right at the knee or a tiny bit above. I will have to try a bit longer length and see if I'm happier with that. About the reunion…part of me thinks I should wear the Lida Baday dress….and not waste money on a new one, that I'll probably only wear once or twice. But part of me really wants to get a new one. It's a really good question. Of course, the real you is the you inside, but never mind that:). The next realest you is what people see IRL. And what gets closest to that? So hard to say! I love the way you proceed to figuring out an outfit, probably it's so much the way I do it:). But very useful to hear your thought process, and see the results. I love the dresses you pick – I can totally envision the look you're going for. Like the dress you have, in spirit, but adding in a little more fabric and color to add back the zhush that the years tend to subtract. Yep…now I just have to find the dress. That's the hard part. Shopping for dresses in Ottawa is an adventure in frustration. 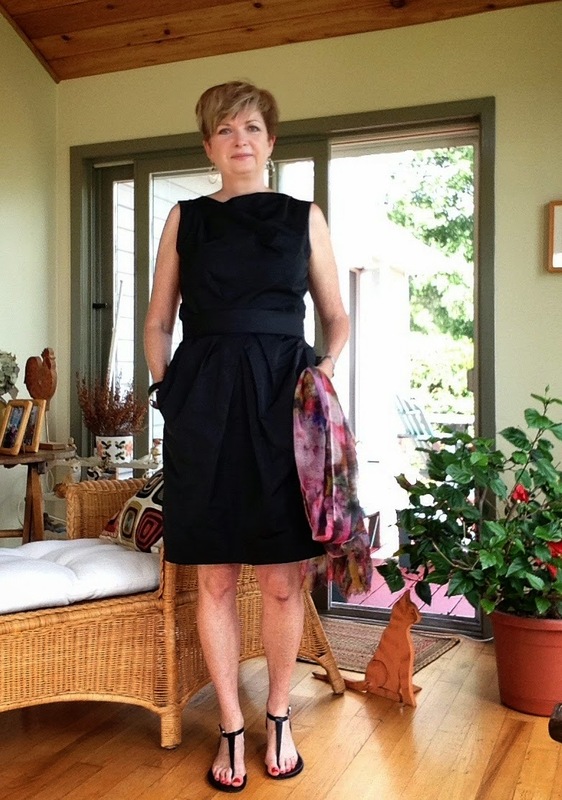 Not many stores carry chic/edgy/good for over 50 and NOT matronly nor prom dress-ish. Stopping in during the blog hop from Katherine's Corner. I think you look great in the black dress. I would pair it with a different pair of sandals, though. Maybe red or silver strappy ones instead of these black ones which look a little too casual for the dress. I like the idea of wearing a scarf, but it should coordinate with your shoes. Killer earrings with lots of sparkle, a great bangle or two and a fabulous clutch purse in sparkly black. I know you don't know me, so have no way of knowing if I am being honest, but believe me when I say you really do look great in that dress! You're right about the sandals being too casual for the dress. I might start my shopping by finding a new pair of shoes that will go with the dress…but then if I don't wear the dress…well, I guess I'd always have them if I went to another event. It's just that my lifestyle is such that I don't go to a lot of things that require I dress up. I'm going to get that dress back out now and try a bunch of different things with it…including different jewelry. Thanks for hosting the blog hop! I like all of these styles…and I love your Michael Kors bag!! I also think you look great in the black dress…so many different things you could do with it. Thanks for sharing on the Thursday Blog Hop! Thanks, Pam. And thanks for hosting the Blog Hop. Thanks Patti. I'm keeping the black dress as a back up…but still looking for something I really love. Thanks for hosting Visible Monday. I think you look lovely in the black and white dress. I'm not sold on the little black jacket but I like the sophistication of the LBD and love the scarf. I appreciate blogs like this because this is what real people look like and they look great. We would all look better airbrushed but that is not going to happen. I guess airbrushing is okay if you never have to meet people in person:) Thanks for reading. Oh my goodness, honey. The only "lie" here is the lie you are telling yourself about your looking poorly. You look lovely in every single photo here, including your childhood photos. You do not look wide or knobbly or whatever other hurtful adjective you hurl at yourself when you see your photographs. Your self-esteem about your appearance may be low, but it is lying to you. You look good. Thanks Charlotte. And thanks for stopping by. yeah, unfortunately it is mainly an issue of "we are FORTY years from high school"…I too had my 40th high school class reunion this summer and had a wonderful time. ..your dress choices would be too formal for my class! – we met at a local country club for a catered meal and mingled and talked for hours..it was great fun and just so nice to SEE people that I really did not correspond with anymore…we were a class of 120 in the Midwest and 17 of us are passed on, so even being alive seemed somewhat of an accomplishment! ha. People tell you "don't be too hard on yourself", but I think we DO need to be a little "hard" on ourselves or the extra pounds creep up, the numbers (bp, weight, cholesterol, etc) rise and we join the ranks of sluggish huge American women who think aging equals slowing down and settling for less in our personal lives. Whether we admit it or not, our appearance is very important to us and how much we physically move around and WHAT WE PUT IN OUR SYSTEMS (I'm talking nutrition here) is directly related to our physical and mental health. If you need affirmation, well, you look nice; push yourself to look awesome! I don't really need the affirmation, but thanks…. I didn't actually do the post for affirmation. My self esteem is pretty good most days. I just thought it was interesting that we can see ourselves so differently through different lenses. And I agree…we do need to be "hard" on ourselves to a point. Fitness and good nutrition are so important to living well and enjoying retirement. But realistically our bodies do change as we get older…and pushing too hard can result in injury… as my phys. ed. teacher husband keeps telling me. We work with the "material" we've got…and genetics and body type certainly limit what we can achieve in our quest for awesome-ness. Yup .. you're being too tough on yourself. We all identify, though, and it is absolutely true that the camera lies like a dog on a rug. I'm guessing that you have a digital SLR, and don't know what kind of lens you have, but most point and shoot digitals have a wide angle lens, which broadens everything! Mirrors just reverse us .. we never see ourselves as others see us. I'd never worry too much about defining your waist in a straight dress. It's clear you have one from the rest of your willowy figure. I'd love to be one of those women who love photos of myself, but as I say that I realize I don't know any! Oh gosh, so many things to say here. First, I share your self-image issues, your photo-issues, your childhood pics issues, etc. Second, omg, I can't count all of this. First, the first dress was darling. It gave the impression of a waist even though you pointed out you didn't have one, and I had to go back and look again to see what you were talking about. Knobby knees? Too short? I didn't think so, but if lowering the hemline made you feel better, no prob, and again, with the purse, terrific! 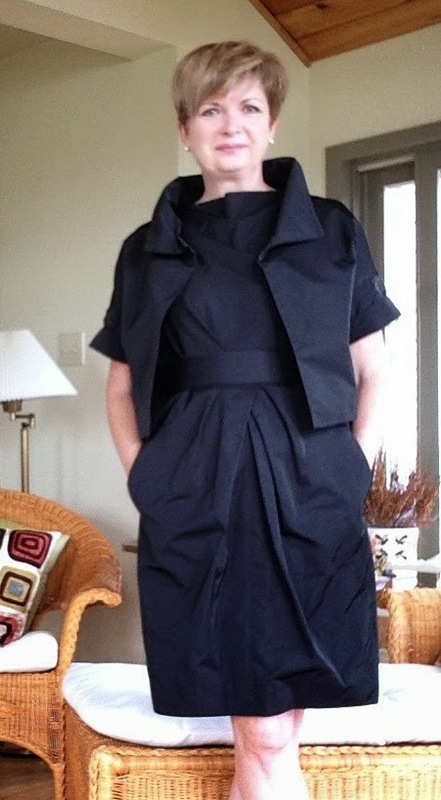 Next dress–the angle was bad in the first shot, but I wasn't loving the dress. When you added the jacket? OMG I WANT THAT. You looked fabulous. Could you bling it up with something more interesting? Yes. But that jacket and that dress looked great to me, and again, the jacket gave more shape to the dress, and also, the collar around your face pulls the attention up. Finally, that pic of you in fishing waders is fabulous. Maybe you always loved it. I wonder, though, if you did love it back then. I look back at a lot of pics from when I was younger and think, you know, I was kind of cute! Or I looked great in that pic, wow! When at the time I hated them. Thanks Patricia. 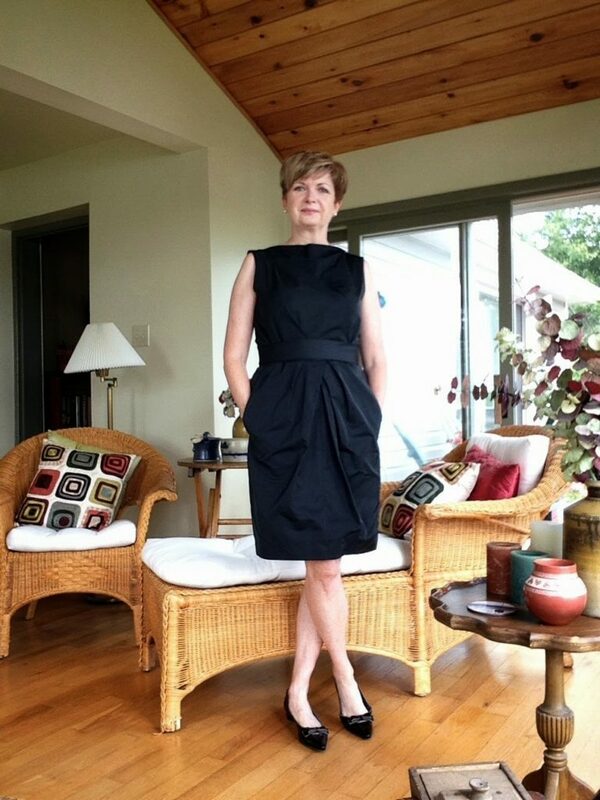 The angle on my first shot of my black dress is terrible….you're right. And now that I think of it I probably didn't like that shot of me fishing as much at the time. When I remember now the body image issues I had in my 20's and 30's …I often say "What was I worried about?!" Maybe the secret is to look at oneself now as we will look back at this age when we are …80…and say "Wow..pretty darn good for 50-something!"